Chinese Dance at Mason County Library - "Makings of Master"of Kentucky Arts Council Program. Dance to Chinese New Year 2019 - 2/10/2019 @ 2pm at Central Public Library Farish Theater. Crossing Boundaries​ - An evening with American and Chinese dance: 9-8-2018 at UK Singletary Center for the Arts. KAR National Dance Competiton - 3/24/2018 at Richmond, Kentucky. Congrats to Kelly Chen whose solo The Big Pretty Girl won Elite top first place and 1st highest score overall. New Year Eve-Eve Fashion Show and Party on 12-30-17 at Smiley Peter Publisher at Aug 19, 2017 at Dancers' Studio. Professional dancer Nathan Fister will teach a serial of master classes from Aug 20 - Sep 16. KAR National Dance Competition - 4/1/2017. Richmond, Kentucky. Congratulations Girls! Way to Go! Very proud of you! 1) Group Dance - Magnificent Silk Road - won Top First Place, 1st Highest Score Overall , Judges' Choice Award. 2).Group Dance - Qin Ge Da (Joy) - won Top First Place and 5th Highest Score Overall, Invitation to NeYork Master Class Convention . 3). Solo - Mengolian Dance Heave - Won Elite Top First Place and 3rd Highest Score Overall. Invitation to Hollywood and New York Master Class Convention. 4). Trio - Spring - Won First Place. 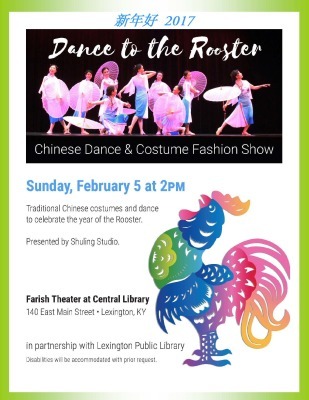 Dance to the Rooster - Chinese New Year Celebration - 2/5/2017 Central Public Library Farish Theater. Performing photos at Facebook @shulingstudio. Angel's Fashion Show - 04/02/2016, Presenter: Laura Kirkpatrick Candy Land Fashion show. Location: Lexington Black Box Theater downtown. Congrats to all our SS models, you were fantastic and beautiful at the runway.